JOSEPH P. THOMPSON is a retired farmer living in Greenville, Bond County. A self-made man, by his own efforts he has worked his way upward and achieved the success which brought him a comfortable competence and enables him now to lay aside all business cares. He was born in Davidson County, Tenn., October 31, 1822. His grandfather, Joshua Thompson, was a native of Ireland, who emigrated to America and settled in Virginia, where William Thompson, the father of our subject, was born. The latter went to Tennessee in 1816, and married Sarah, daughter of William Scalley, a native of Tennessee, born of German parentage. William Thompson was engaged in farming in Tennessee until 1837, when he removed to Lawrence County, Ind., where he continued his agricultural pursuits until 1853. In that year he went to Missouri, where he spent the remainder of his life. In politics he was a Democrat, and knew Gen. Jackson and Zachary Taylor, becoming acquainted with the latter while serving as Corporal in the Black Hawk War. With some others he got a quantity of honey from a bee tree, and they presented the best of it to Gen. Taylor, who did not even thank them for the gift. From that time Mr. Thompson had not a very high regard for Mr. Taylor. We now take up the personal history of our subject, whose boyhood days were spent upon his father's farm. His education was acquired in the common schools, and he afterward engaged in teaching in Virginia. Later, he engaged in merchandising in Indiana for four years, and in 1846 embarked in fanning in Lawrence County, Ind., where he spent ten years. 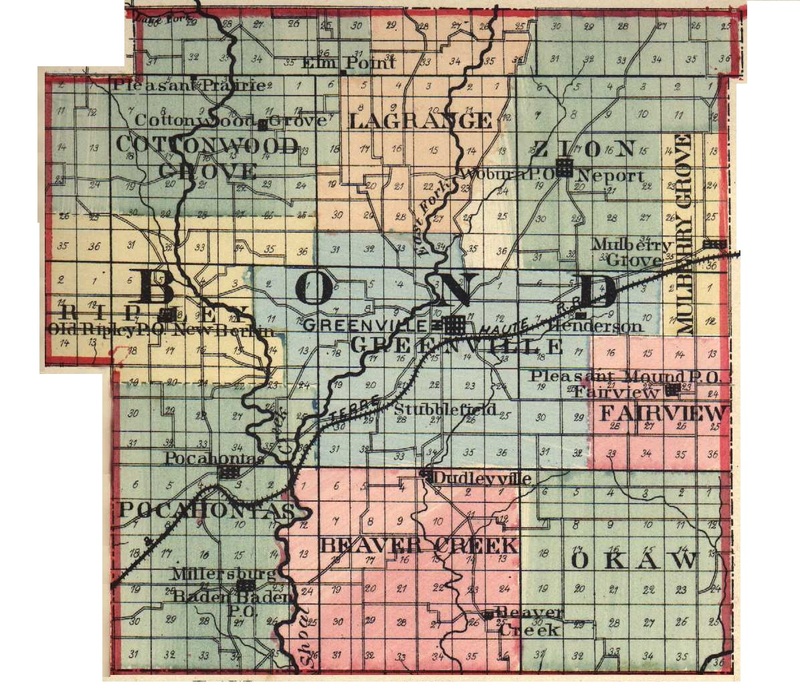 The year 1856 witnessed his arrival in Bond County, where he located near Elm Point, LaGrange Township, and purchased, on July 4, one hundred and ten acres of land, which he developed and improved. He extended the boundaries of his farm until it comprised over four hundred acres, and made his home there until 1875, when he sold out and purchased three hundred and forty acres elsewhere, devoting his energies to the cultivation of the latter tract until 1881, in which year he came to Greenville. He here purchased four lots and three acres of land adjoining, and now has a fine home with beautiful surroundings. In 1846, Mr. Thompson wedded Miss Elvira Hoopingarner, of Lawrence County, Ind., and unto them were born six children: Thomas B., the eldest, married Jennie Sharp, and has three children, William, George and Cecil; Mary J. is the wife of Thomas Foster, by whom she has eleven children: Thomas, Joseph E., Annie, William, Estella, Ellen, Renna, Bevey, Blaine, Frank and Pearl; John M. married Miss Nancy Walker, and they have four children: Arthur, Pearl, Grace and John; Joseph P. is the next youngest; George F. married Rosa Williams, and has one son, Harold B.; and Moses E. married Isephine Watts, and they have two sons, Joseph T. and Dwight M. The children all reside in this county. The death of the mother occurred in 1865. She was a member of the Methodist Episcopal Church. Mr. Thompson was again married, in 1866, his second union being with Mrs. Permelia Henderson, of Orange County, Ind. Four children grace this marriage: Maggie, wife of Shelton Jett, of Kansas; Ida, wife of Henry M. Blizzard; Harry M. and Elva M. at home. Mr. Thompson exercises his right of franchise in support of the Republican party. He served as Justice of the Peace for eight years, as City Alderman of Greenville, and has been honored with other offices. Industry and enterprise are numbered among his chief characteristics, and by his upright dealing and good business ability he has won the prosperity which has justly crowned his efforts. Extracted 20 Dec 2016 by Norma Hass from 1892 Portrait and Biographical Record of Montgomery and Bond Counties, Illinois, pages 282-285.